The English eat courgettes (zucchini) and when they get too big for normal zucchini recipes they let them keep growing and then they magically turn into marrows. Well, they don't actually magically turn into another vegetable, the English just change what they call it and how they eat it. Mostly they deal with marrow by pickling or preserving it. That's why I was excited when my air conditioner repairman said he had a horse trough full of squash and quite a bit of it was going to go to waste since they were really too big to eat. I asked him (as one does when one has a new service man out on a call) if I could have them and he said he would bring them by. He did and I made marrow pickles out of them. It was an experiment that I think worked out. Though, I haven't tested it out with my method of shoving food in various people's mouths and asking, "Was that a plus or a minus?" I will let you know the outcome. Until then, here is my very scientific approach to cooking being employed once again. Peel and cube marrows. Place in a casserole dish and liberally sprinkle with salt. Cover with a tea towel and leave overnight. The next morning, rinse marrow under cold water for a good while and drain. Put vinegar and spices in a saucepan and boil 15 minutes. Pack marrow in hot sterile jars and pour over vinegar. Seal 'em up and process. Keep any leftover vinegar solution in the fridge and when you want to quickly pickle a vegetable, you can boil the vinegar, pour it over the vegetables, and put them in the fridge for a couple of hours. *Update* As it turns out, people did like them and since many of our friends are on low-sugar diets, they loved them because they had lots of flavor and no sugar. *Update #2* My parents and brother tried them and all they could say was about how spicy they were although my brother did say that they had a nice flavor - thanks Bro Man. *Update #3* I tried them and really liked the punchy sour & spice thing they have going on. 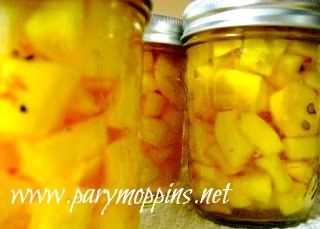 This recipe is now on the yearly canning recipe rotation: a definite plus! Ooh I love this idea! I'm hoping that my zucchini actually grow this year, and I'll have to try out this recipe! Lovely!